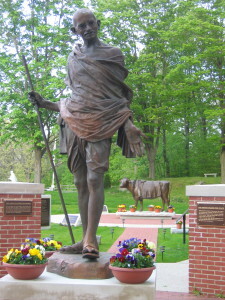 Gandhi Statue at the Pacifist Memorial in Sherborn, MA. 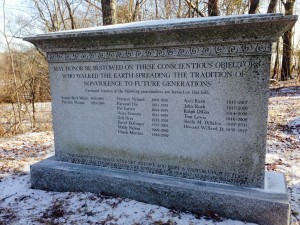 The Pacifist Memorial in Sherborn, MA. 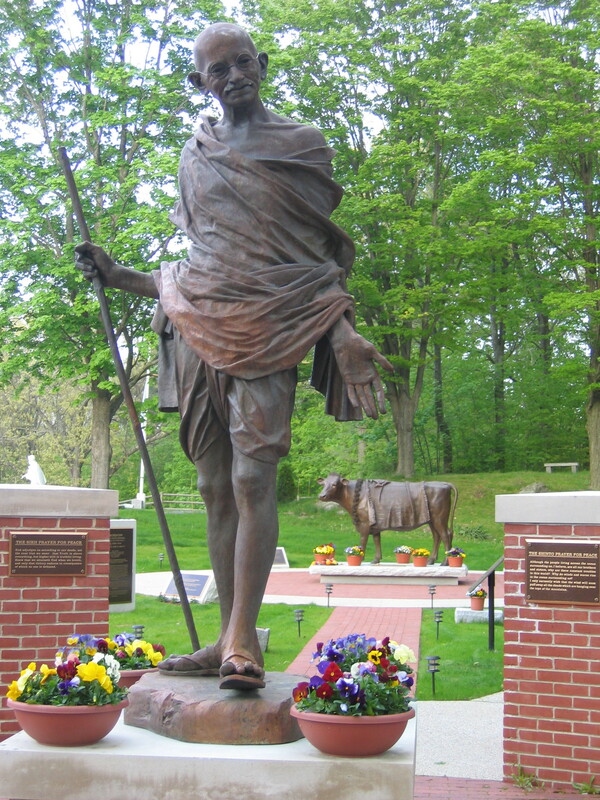 Bronze Gandhi statue at the Pacifist Memorial in Sherborn, MA where over 65 pacifists throughout history are acknowledged through a quotations on bronze plaques. 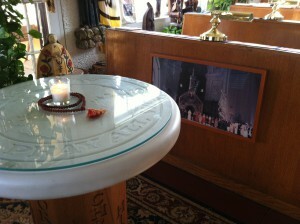 The Pacifist Memorial is an Open-Air Peace Chapel of the World’s Major Religions. 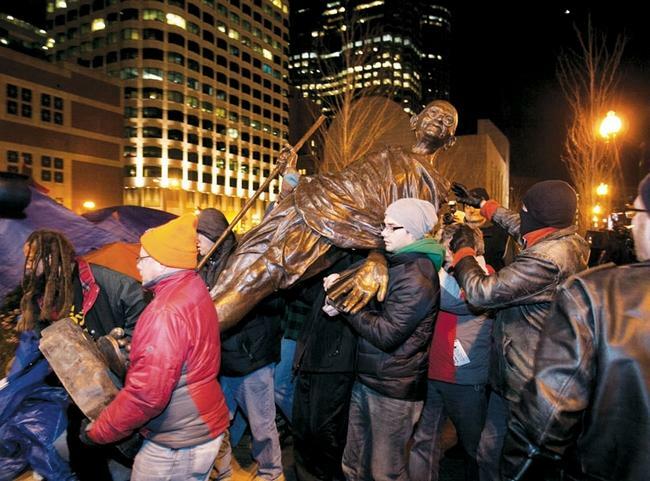 Chris Randa and other activists move Gandhi statue hours before Occupy Boston ended. 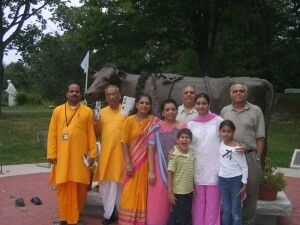 Within days, a nine foot statue of Mahatma Gandhi was brought to the Occupy Boston encampment as a symbol of peaceful, nonviolent civil disobedience by the Peace Abbey of Sherborn, MA. The ten week long citizen’s occupation to protest economic injustice ended on December 10, 2011. It was the longest continual Occupy demonstration in the country. Dewey Square is the proposed location of the bronze statue of Gandhi as a gift to the City of Boston. With the uprising of discontent in America over what was perceived to be unbridled corporate greed and disregard for human needs, the Wall Street Occupy Movement spread to Boston on September 30, 2011. 1% of the world’s wealth is owned and controlled by 80 people. That Strange Brown Man, Gandhi Gandhi is standing in the bustle of Occupy Boston. The wry smile, the flapping ears, and the walking stick in hand. A sign flags near his knees, “The world holds enough for everyone’s NEED, but not enough for everyone’s GREED.” People rush past him, walking on the wooden planks that work as the walkways between tents in Dewey Square. These people are temporary heroes, the people who have walked away from their ordinary lives to seek shelter together in the public square. Some of these people are happy, pleased to be together and to model a different social life. Others are already cold, already a bit dispirited. The days have begun to drag on. The novelty will wear off. It is precisely to ward off a drop in morale that Gandhi warned his fellow activists, “If patience is worth anything, it must endure to the end of time. And a living faith will last in the midst of the blackest storm” (Young India, June 17, 1926). Quakers from the Peace Abbey in Sherborn, Massachusetts, brought the statue to the site. They had made it as a gift to Goldman Sachs. On October 28, 2010, the Abbey workers and children from the Life Experience School came down to the Goldman office on High Street, not far from Dewey Square. 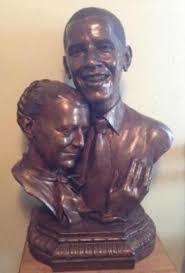 They wanted to install their statue of Gandhi as a beacon against Greed. Goldman’s people declined the offer, so Gandhi was then chained to the doors of the building. He didn’t last long, went back to the Abbey, and then, when Occupy Boston started, came to his place amongst the protestors. Blessed Mother and Child statue, which was in the circular drive in front of the Peace Abbey for 25 years, was gifted and re-dedicated on Mothers Day 2013 at Holy Family Church in Duxbury, MA. 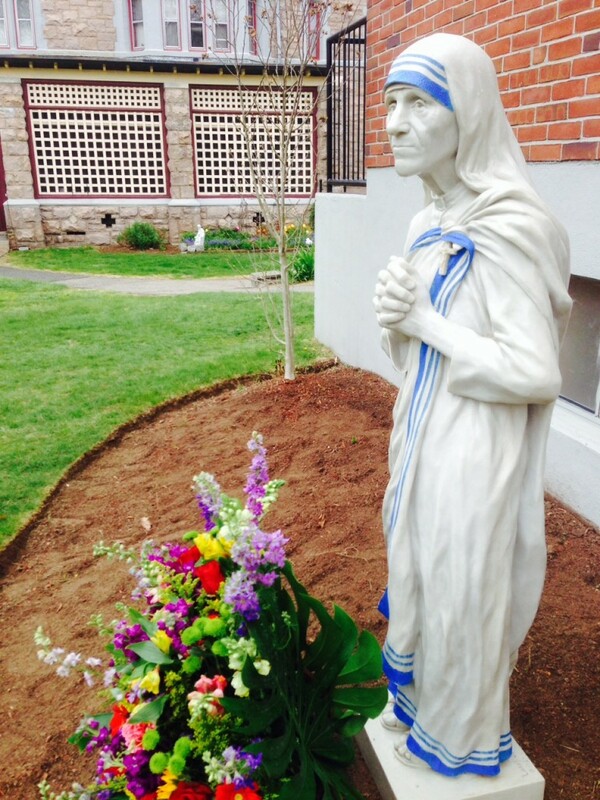 The sculpture was originally given to the Peace Abbey / Life Experience School by the Sister Disciples of the Divine Master. 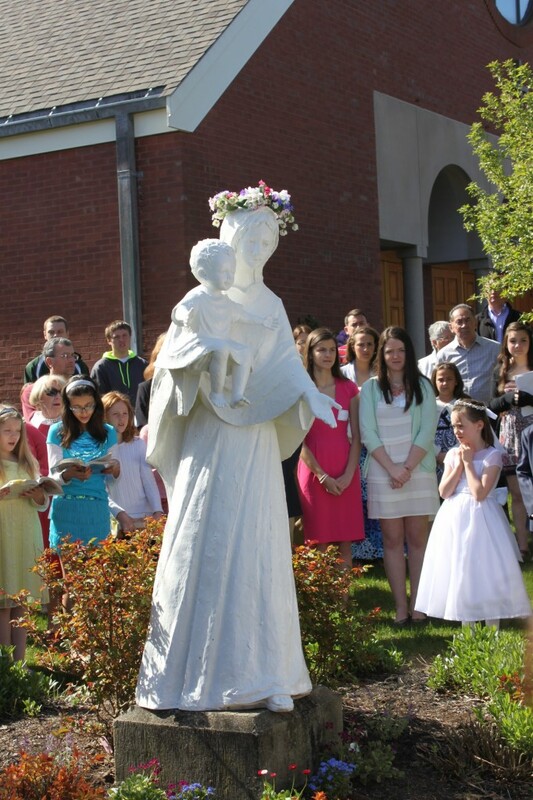 The original statue was sculpted by world renowned artist, Sr. Angelica in Rome, Italy. 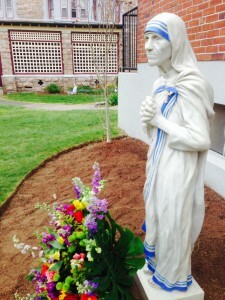 The original statue of Mother Teresa, commissioned for the Peace Abbey. 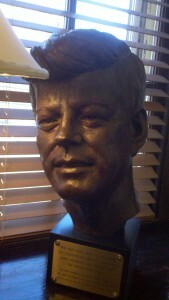 was the centerpiece in the Joseph Campbell living room in the Guesthouse. It was given to St. Mary’s Church when the Abbey closed its Guesthouse. The Romero Project was started to help generate funds for humanitarian efforts in El Salvador through the creation and circulation of 12″ rubber medallion molds of Monsignor Oscar Romero. These molds, sculpted by Lado Goudjabidze, are given free of charge to schools, hospitals, churches and community centers in villages in El Salvador. Provided with instructions on how to mix and pour inexpensive plaster into the molds to create a beautiful wall hanging, the Romero Project seeks to place in the hands of those who loved the late Archbishop the means to generate additional income for their families, groups or organizations. Romero molds at the Romero Center with University of Iowa students. 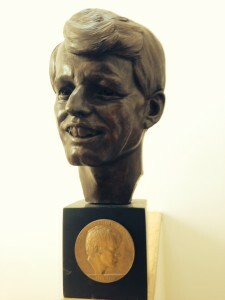 Original bronze bust presented to Ellwood Keiser, Producer of the Film Romero. 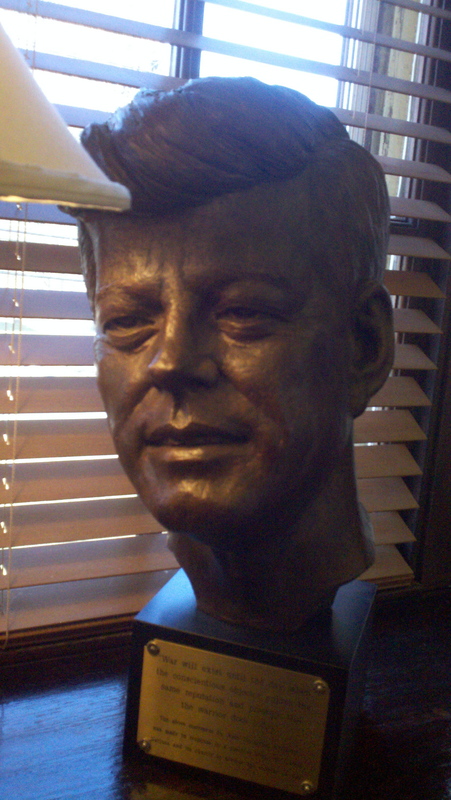 Romero Bust in front the Romero Center and Museum, San Salvador. Bust of Oscar Romero in front of the cottage on the grounds of the Hospital of the Divine Providence, San Salvador, El Salvador. PEACEABLE KINGDOM OF THE BRANCH by Edward Hicks, gifted to East Sandwich Friends Meeting. This framed print from the Archives collection at Swarthmore College hung over the fireplace in the Quaker Room at the Peace Abbey Conference Center for 25 years. 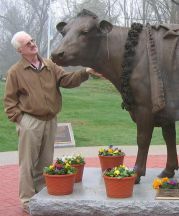 Its “vegetarian implications” were central to the teachings at the Peace Abbey as it operated Veganpeace Animal Sanctuary where food production animals were cared for following their escape from the local slaughterhouse in Hopkinton, MA. 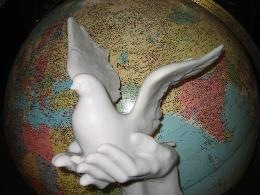 Gandhi and earth image on the Peace Seeds medallion. The Peace Seeds represent the twelve prayers for peace prayed in Assisi, Italy on the Day of Prayer for World Peace during the United Nations International Year of Peace, 1986. The Prayers were brought to the United States and entrusted to the care of the children at The Life Experience School. Peace Seeds can be acquired from the Peace Abbey for a small donation. 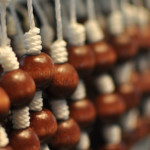 Peace beads are strung together to form the Peace Seeds Rosary by Roy and Dorothy who devote themselves to prayerful service to others. 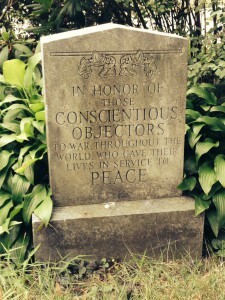 Honoring Conscientious Objectors. 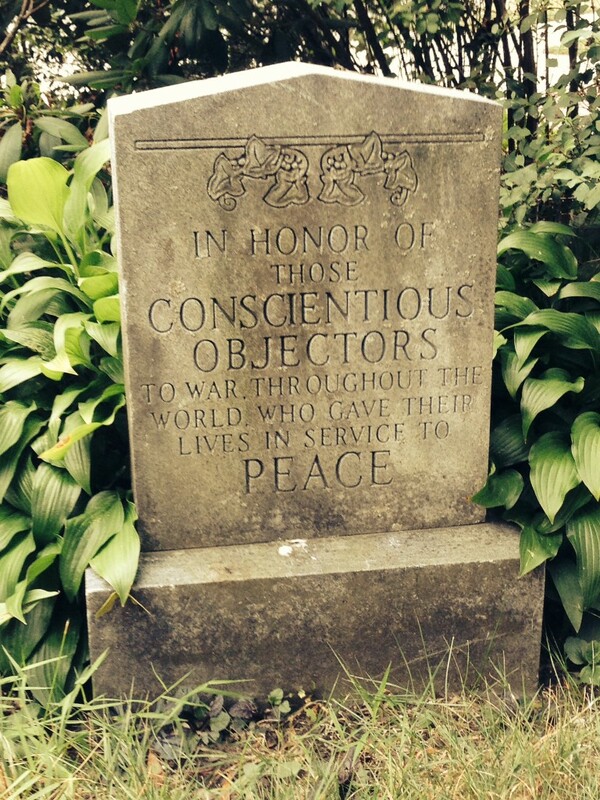 Stone honoring Conscientious Objectors created by the Peace Abbey was gifted to Cambridge Friends Meeting and is located in the side garden to the left of the Administrative Offices. It was pulled by Stonewalkers from the Abbey to Friends Meeting Cambridge. This is the first of many stones to be created by the Life Experience School. 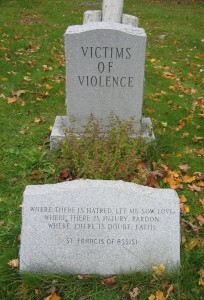 Victim of Violence Stone was dedicated by Fr. Daniel Berrigan on May 4, 1994 during the unveiling of the Gandhi statue. It was created to honor all victims of violence, whether domestic or state sponsored through the death penalty or the waging of armed conflict. CO stone installed by Dan, Leah, Jonah and Lewis. Granite Memorial Stone for Conscientious Objectors. Buried here are the ashes of over a dozen pacifists who devoted their lives to social change through the power of nonviolence. The names engraved on the Memorial Stone include Pat Farren, David Dellinger, Wally Nelson & Chuck Matthei, Lynda Bock Weitz, Paramal Das, Ralph DiGia, Ann & John Rush, Patricia Watson, Zell Draz, Norman Nylund, Tom Lewis, Sheila DeSalvo and Howard Willard, Jr. 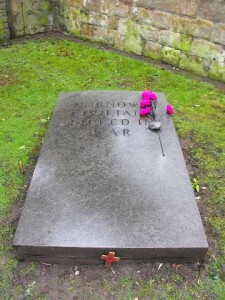 The memorial stone on the grounds of the Peace Abbey. 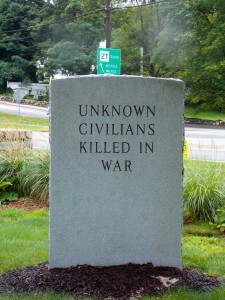 Memorial Stone for Unknown Civilians Killed in War on the grounds of the Pacifist Memorial next to the statue of Mahatma Gandhi in Sherborn, MA. Located where Routes 27 & 16 fork in Sherborn, MA. The Coventry blitz from the German word Blitzkrieg meaning “lightning war” was a series of bombing raids that took place on the English city of Coventry. Memorial Stone for Unknown Civilians Killed in War placed at St. Michael’s Cathedral in Coventry, England in 2001. Pulled by Stonewalkers from Liverpool to Coventry where it was placed in perpetuity during a special ceremony at St. Michael’s Cathedral which was bombed during the WW II. Memorial Stone pulled from Nagasaki to Hiroshima, Japan by Stonewalkers and placed in perpetuity at the Hiroshima World Peace Memorial Cathedral on August 6, 2005, the 60th anniversary of the atomic bombing. 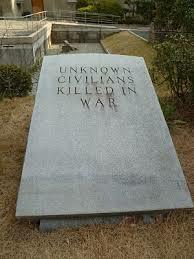 Memorial Stone for Unknown Civilians Killed in War created and pulled by Japanese Stonewalkers from the Southern coast of South Korea to the DMZ in 2007. 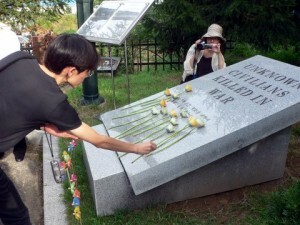 The Stone is placed in perpetuity at the Korean demilitarized zone. Commissioned altar with the words: Always Pray â€“ Pray all Ways with Earth design and the names of the 12 major religions carved into each of the 12 sides of the base of the altar. Designed by Lewis Randa. 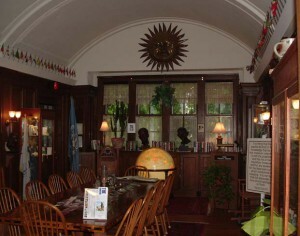 A replica was created by Wellesley College, Multi-faith Chapel. PEACEMAKERS TABLE AT UMASS BOSTON Re-dedication of the Peacemakers Table at the University of Massachusetts at Boston. Among the noted peacemakers that met at the Abbey Peacemakers Table are: Mother Teresa, Muhammad Ali, Maya Angelou, Howard Zinn, Arun Gandhi, Camila Sadat, Raul Julia, Thich Nhat Hanh, Daniel Berrigan, Richie Havens, Ram Das, Helen Caldicott, Ramsey Clark, Barry Crimmins, Michael Klaper, Harry Wu, Ralph DiGia, Dave Dellinger, Patch Adams, Hugh Thompson Jr., Stanley Kunitz, Ngawang Choephel, Betsy Sawyer, Elise Boulding, Michael True, Roy Bourgeois, Paul Rusesabagina, Camilo Mejia, Cindy Sheehan, Francis Crowe, Gene Sharp, Will Tuttle, Tommie Smith, John Dear, Mother Anonia Brenner and numerous other extraordinary peacemakers. The Peacemakers Table was dedicated to the lat Quaker scholar and peace activist, Elise Boulding.